Blueberry Pancakes are delicious, with their golden brown crusts, their light and spongy texture, their rich and tangy flavor, made all the better by the sweetness of the blueberries. They go perfectly with real maple syrup, and maybe a couple of sausage links or a few strips of bacon. Pancakes seem almost too good to be true. They taste great, they are quick and easy to make, and they use inexpensive everyday ingredients - flour, sugar, baking powder and soda, salt, eggs, buttermilk and butter. Now, each of these ingredients has a purpose. First, the flour. Flour contributes to the body, structure, texture and flavor of these pancakes. A little sugar is added to give the pancakes a touch of sweetness, yet it also adds moisture and helps to give the pancakes their lovely golden brown color. The baking powder and baking soda obviously provide the leavening, giving the pancakes their light and airy texture. Salt has the ability to bring out the flavors of all the ingredients. The egg provides color, texture, flavor and richness to the batter and it helps to bind all the ingredients together. And let us not forget the butter which adds a rich flavor as well as helping to make the pancakes wonderfully tender. And finally, the buttermilk. Buttermilk has a thick and creamy texture, and a rich, tangy, and buttery flavor that makes pancakes tender, fluffy, and soft. Buttermilk is commercially made by adding a bacteria to whole, skim, or low fat milk. But you can also make your own by simply adding 1 tablespoon of white distilled vinegar, cider vinegar, or lemon juice to 1 cup of milk. Just stir the vinegar or lemon juice into the milk and then let it stand 5 to 10 minutes before using. Another option is to buy buttermilk powder so you always have it on hand. Once the batter is made, all that is left to do is to cook the pancakes. Try to use either a heavy gauge pan (skillet) or griddle. Preheat the pan before greasing it with melted butter or oil. Keep in mind that you may have to adjust the heat as you go to ensure that the pancakes have a lovely golden brown crust and are cooked all the way through. Another option is to use an electric griddle with the temperature set to 350 degrees F (180 degrees C). You can pour or ladle the pancake batter onto the bottom of your pan and you can make the pancakes any size, from the size of a silver dollar to almost the full size of your pan. 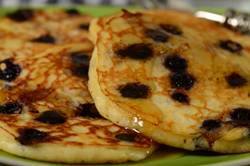 While one side of the pancakes are cooking, evenly sprinkle the uncooked tops with either fresh or frozen blueberries. (I like to use frozen wild blueberries as I like their smaller size.) When the bottoms of the pancakes are golden brown and bubbles start to appear on the uncooked top surfaces of the pancakes (2-3 minutes), turn them over. Continue to cook the pancakes until golden brown and cooked all the way through. If not serving immediately, place in a 175 degree F (80 degree C) oven directly on the wire rack. But what if you have leftover pancakes, do you have to throw them away? The answer is no. Simply freeze them. Then all you have to do is to pop them in the toaster, still frozen, until they are warm. Of course, they are not quite as good as freshly made, but they come pretty close. Another question I am often asked is whether I can make the pancake batter ahead of time? The answer again is, yes, you can make it up to a day ahead and store it in the refrigerator. Now, I do find that while the pancakes still taste delicious, they are not quite as light and fluffy as when the batter is made immediately before cooking. But I think the compromise is worth it, as making the batter ahead of time allows us to enjoy pancakes on busy weekday mornings when we usually have to settle for a bowl of cold cereal. Using a small ladle or scoop, pour about 1/4 cup (60 ml) of pancake batter onto the hot pan, spacing the pancakes a few inches apart. Evenly sprinkle the uncooked tops of the pancakes with fresh or unthawed frozen blueberries (if using thawed blueberries, blot with a paper towel to remove any moisture). When the bottoms of the pancakes are golden brown and bubbles start to appear on the uncooked top surfaces of the pancakes (2-3 minutes), turn over. Cook until golden brown (about 2-3 minutes) and cooked through. Serve immediately with butter and maple syrup or your favorite jam. You can keep the pancakes warm by placing them directly on the wire rack, in a 175 degree F (80 degree C) oven, for about 15 minutes. Makes about 8 - 4 inch (10 cm) pancakes. Preparation time about 15 minutes. The Culinary Institute of America. Breakfasts & Brunches. Lebhar - Friedman, Inc. New York: 2005. Plus extra melted butter or oil for greasing the pan.